The Solar Mill is a unique solar water pumping unit designed around the function of a wind mill. A Solar Mill can be installed to pump from a bore or open water source such as a dam or well. They come in various sizes to accommodate most applications. The Solar Mill pump addresses the fact people in remote areas not only need a dependable pump but one that is easily maintained where support is not always close. The Solar Mill was deliberately designed as a low tech product to allow for easy operation & require very little attention. Occasionally the seals need to be checked & the stuffing box needs a few squirts of grease. The majority of components are at ground level allowing for easy maintenance. The pump can be fully automated if required using either a pressure switch or float switch. If required, replacement parts are reasonably inexpensive. There is no need to be an electronics expert, the unit’s electrical components are all plug in, easily removed for checking or replacement. The Solar Mill is an Australian product built in Western Australia. It has been available since 2000. 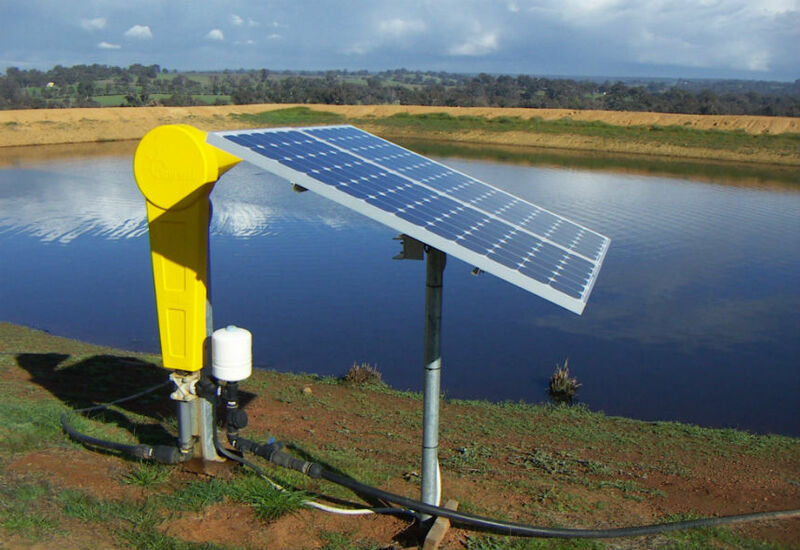 The Solar Mill pump won the year 2000 Western Australian Water Award run by the State Government in the “Farm Water Supply” category. Further details are available in the attached .pdf or contact us.